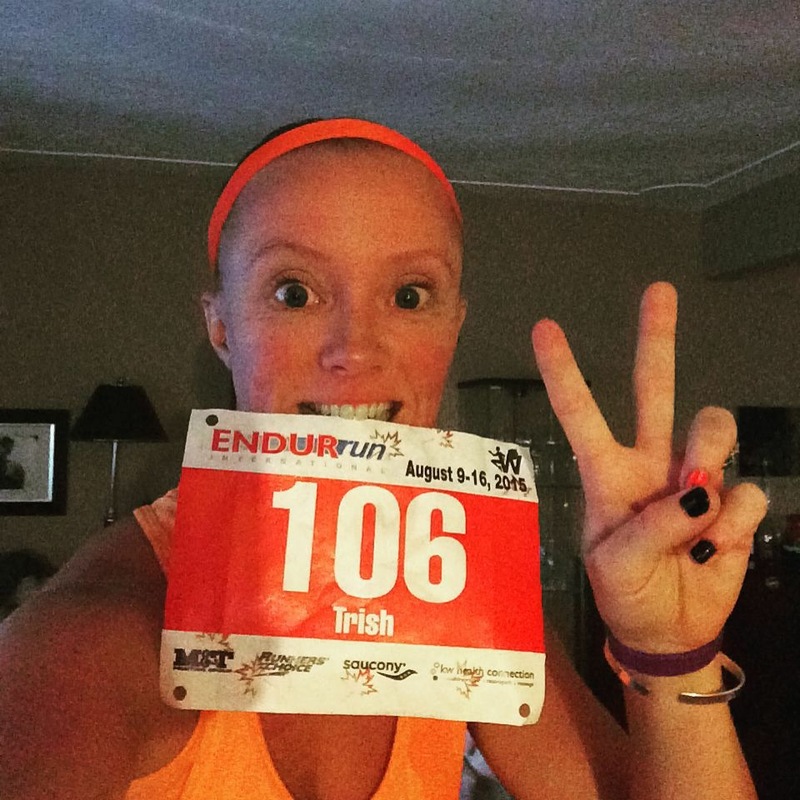 Another Canucking Runner | Yet Another Running Blog..Although This One is in Metric.. 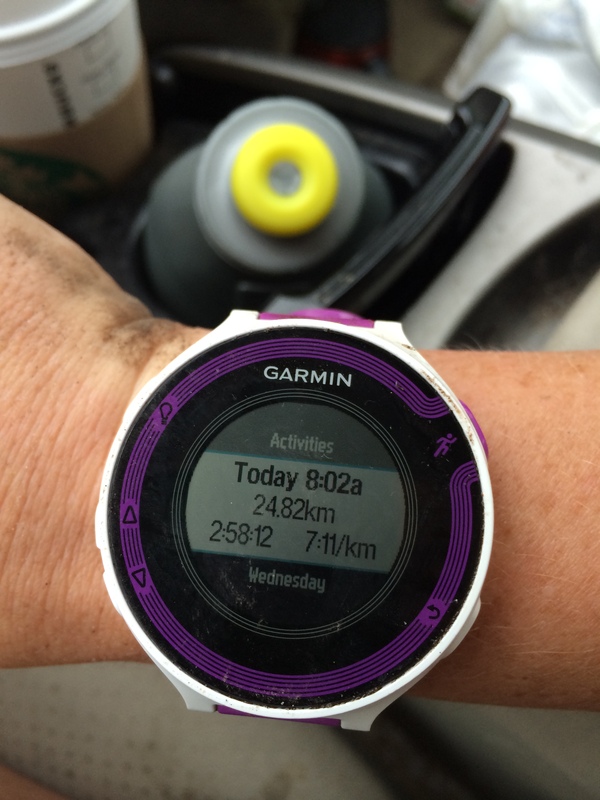 Yet Another Running Blog..Although This One is in Metric.. So I like to think that 6 is my lucky number. 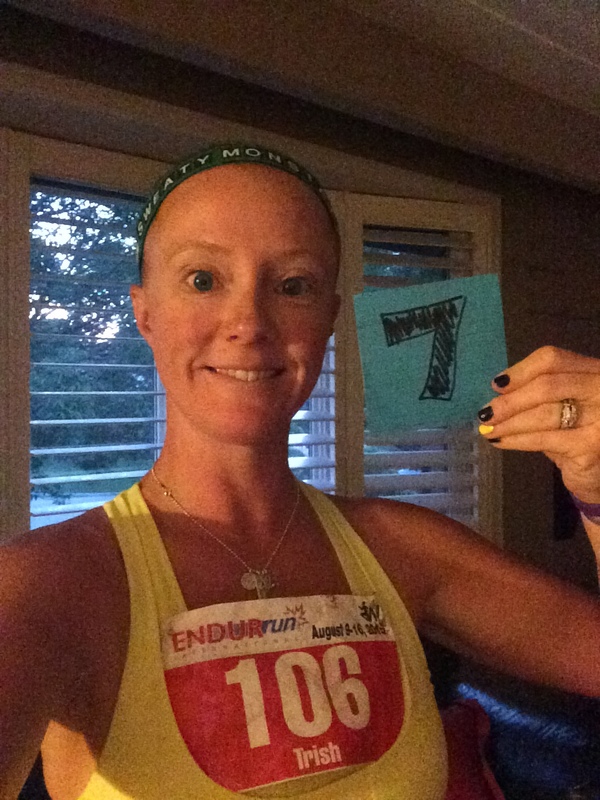 Everytime I run a race I anxiously open my race kit hoping that there is a 6 in my bib number. I’m not sure why it is 6, I just seem to know that it is. I’m a “numbers need to be divisible” kinda girl, and it appears when this number is involved good things happen. I’m also VERY superstitious. This I can trace back to my Grandmother who was from Estonia and also very superstitious. You would be amazed at the amount of superstitions I hold in this brain of mine. Usually whenever I announce a new one previously unheard I get an eye roll from the bestest dude. Sooooooo based on these 2 items alone, I officially declare that 2016 will be my best year yet! I have decided to have big goals in 2016. Not just running goals (although a large number are), but life goals. The past few years have been challenging and I feel like I’ve been living in a world where I have been holding back waiting…..for…..something. Always waiting for something. I have reflected that we spend our lives doing this, and I am particularly guilty of this. Here’s the reality, we only have NOW. That doesn’t mean that I don’t plan for the future, it simply means that I don’t spend so much time focused on it. I will learn to live in the now, enjoy the moments, and strive to be a better me in EVERY. SINGLE. MOMENT. Big feat?!?! I absolutely think so. Will I always meet this goal? Nope probably not, but I will make an effort to try. 2016 is the year of NOW. What will this look like? Well it’s off to great start (minus one sprained ankle xmas eve). 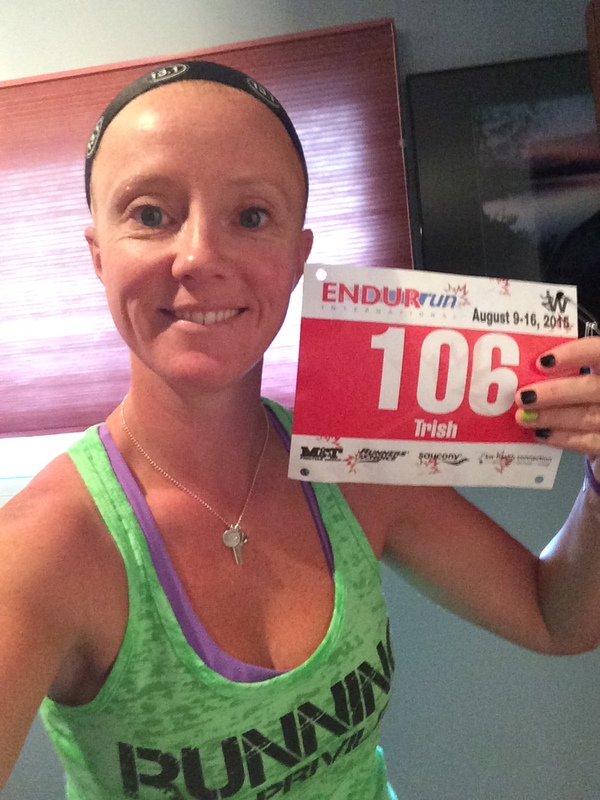 This year I have been accepted to Team Nuun and as an ambassador for CEP compression. 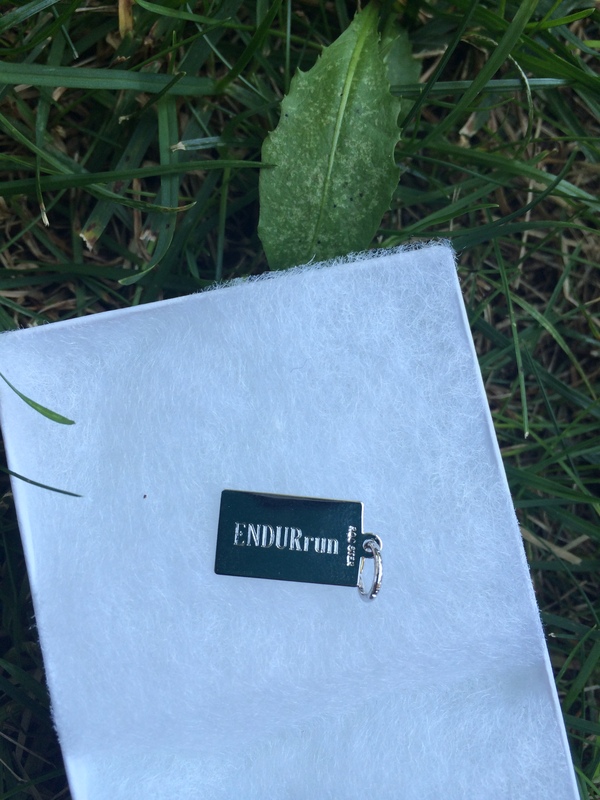 So I am super stoked to represent two running items I feel so good about. 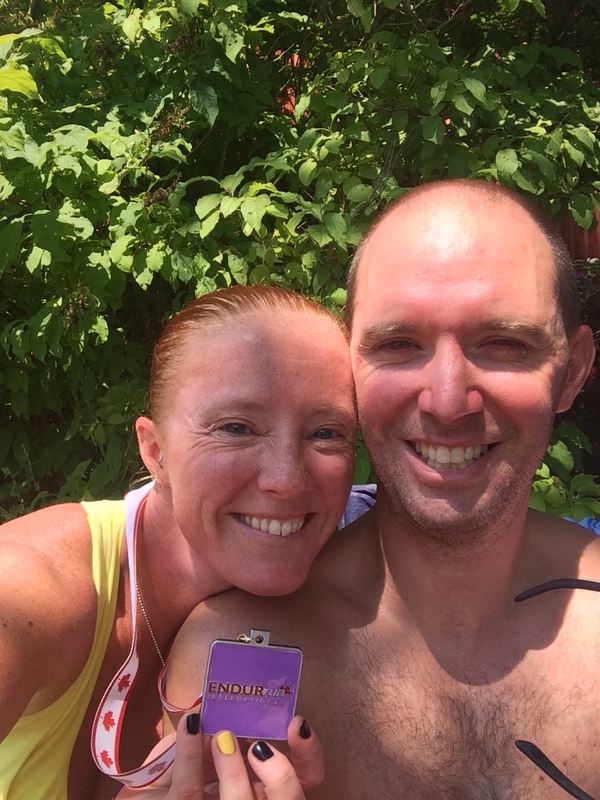 I have 3 5ok trail races, 3 marathons, and I’m super excited to be doing the ENDURrun again this time with bestest dude as a relay team. I am going to focus on revamping this blog, if I can ever figure out widgets, and other social media outlets. I’m going to try to stay connected more to friends and family, and enjoy each and every moment with my husband. I have a trip to Mexico planned, and a golf trip in the summer, along with all those beautiful cottage weekends. So, besides a few extra runs this year it doesn’t sound much different. The difference? I will make an effort to appreciate all these moments more, and be grateful for all that I have received in life. Because it’s my life. Not the Jones’, the William’s, the Smith’s. The Benoit’s and thats pretty darn near perfect. Happy 2016, year of the 6, and year of the now. Welcome to the journey. Sorry that it has taken me a couple days to do this final stage review. 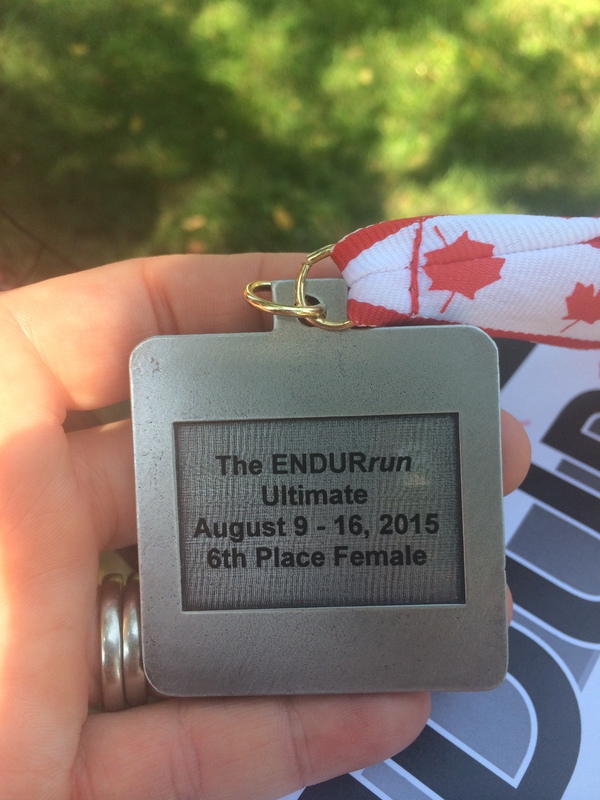 I think my brain and body needed a couple days to transition out of ENDURrun mode, and I completely did. It has not just been a part of my life for 8 days, but for 3 months as I have trained my body to handle the mileage. On Sunday I woke up extremely nervous. There was a heat advisory for the day and I knew that it woul be 30+ degrees out. As I said before I am not a heat runner, and have actually experienced heat stroke. My saving grace was that I had developed a “cooling plan”. I had purchased 2 extra nathan hydration bottles for just this occasion. I stocked a cooler with the second set of bottles, two washcloths soaking in ice water, 2 bottle of water, and some gels. All of this was put on ice and my plan was to switch out at the 21km mark. 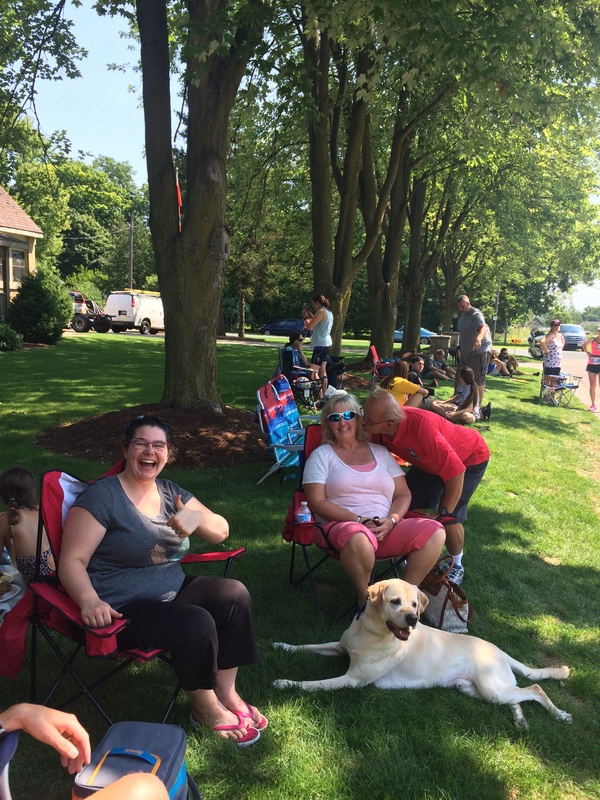 This marathon course was a 2 loop course that ran through Conestogo and Waterloo. I had an AMAZING support team there including my parents, my bestest girls, and my bestest dude. My bestest dude had very last minute agreed to run the last bit of the course with me knwoing it would be tough slugging in the heat. He wouldn’t tell me where he was going to start, just that he would “show up” on the course. I knew that I wanted to run this race conservatively not only because I had already run over 100km that week but because of the heat. My goal was to stay at 6:00/km. I ended up really loving this course. I felt that the rolling hills were managable, and the views were gorgeous! In my first lap the weather had not gotten too hot as of yet and I felt that I was use to the temperature from my recent long runs. I knew that I had completed a 37km run on a scorcher at the cottage, and felt that I should be able to pull through. It was towards the end of the first loop that the sun started to really shine. This course has essentially no shade, so I also decided (with much urging from bestest dude) to wear my hat. I came through the first loop feeling really strong. 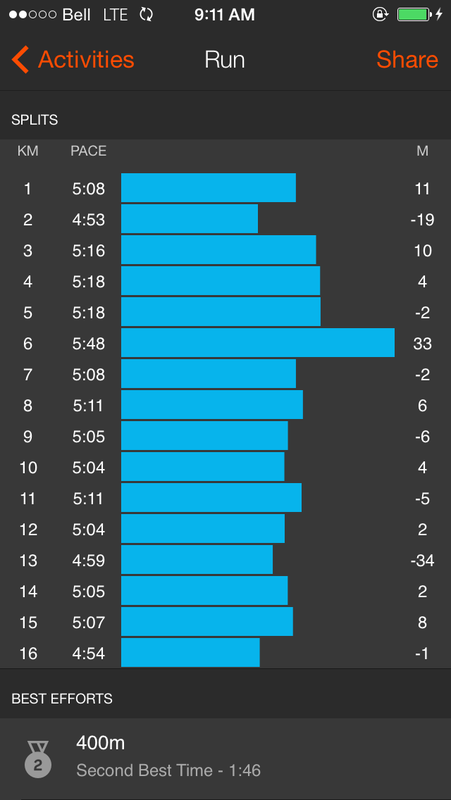 It appeared that the most difficult part for me was going downhill because this is when my quads would scream at me. 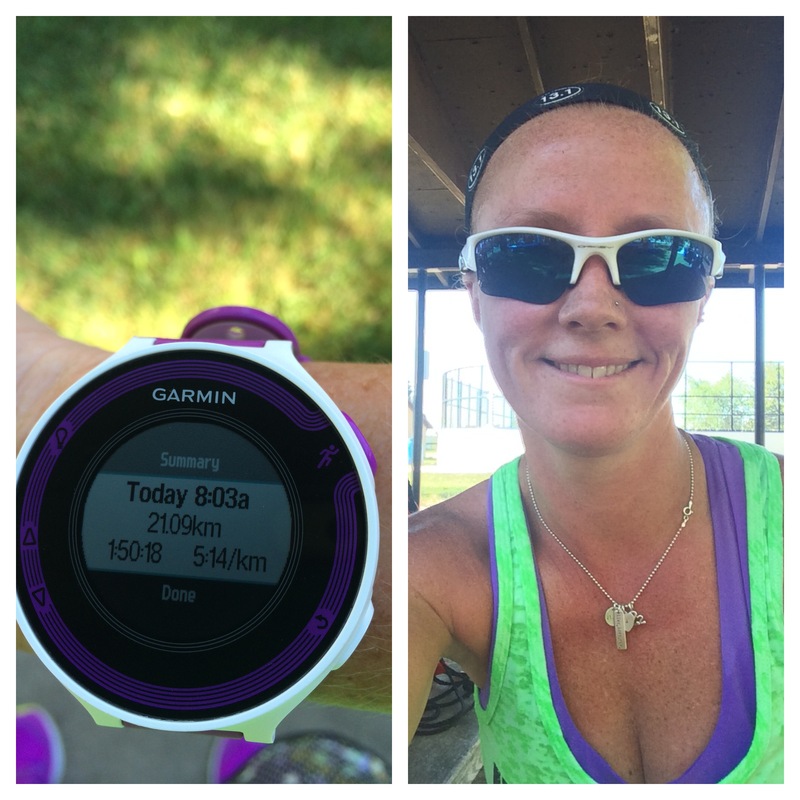 I managed to come in 21k at 2hrs bang on and was running a 5:40/km pace. The cooler at the halfway point worked beautifully! My mom was there to switch things out and spray me down with sunscreen. I took off again with fresh hydration bottle filled with lemon tea nuun. I continued to run up the rolling hills and was determined not to walk till at least 30k and a water station around there. I broke at 27km. The sun was getting really hot and I had just run up a gradual incline. Until this point I had not stopped for any of the water stations. From this point on I walked at each water station to make sure I dumped cold water over my body to cool down. I did however make a very concerted effort to run all the km’s between water stations and actually did so remarkably well. There was a reason I did so well though, it was because of my husband. He was AMAZING! I could see his red running shorts at the 32km mark. It was perfect timing because the heat was getting to me and my mind was playing tricks. He had ran from the finish line out towards me and had plotted out the route and where I could get shade. My dad also showed up shortly after 32k. He had a cooler filled with ice, nuun, and cold towels. 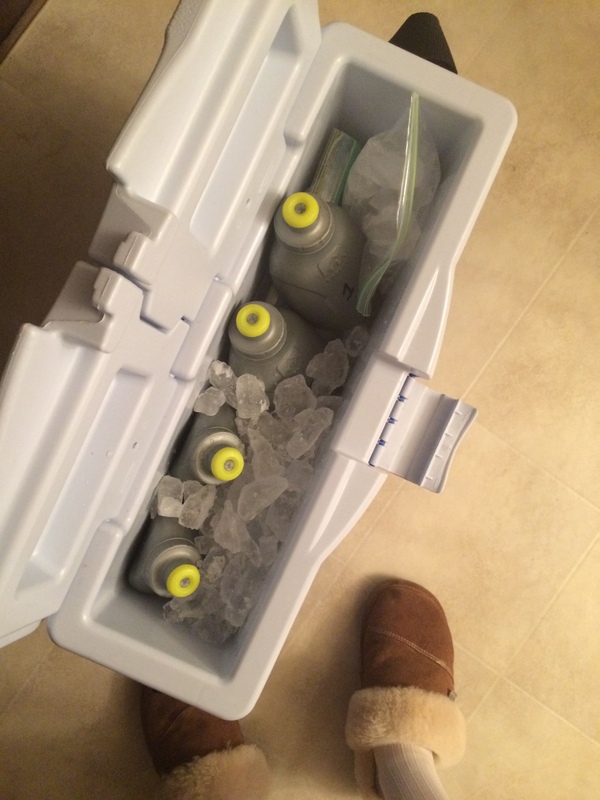 My husband sprinted up to my dad and put ice in my hydration bottles to cool them down. He then grabbed the towel and sprinted to catch up with me. As I was running he was wiping me down with the towel, and carried my hydration bottle for the next few km’s. Dad and husband for the win!!!! Because my husbands legs were a little more fresh he was able to push me to run some 5:30-5:40/km’s in between the water stations. We did walk up the looooong gradual hill on Bridge, and most of the other runners were too. God love the woman handing out ice mid-way through that hill. I put a bunch in my mouth, and then stuff large pieces down my sports bra. Surprisingly this had a really good cooling effect! 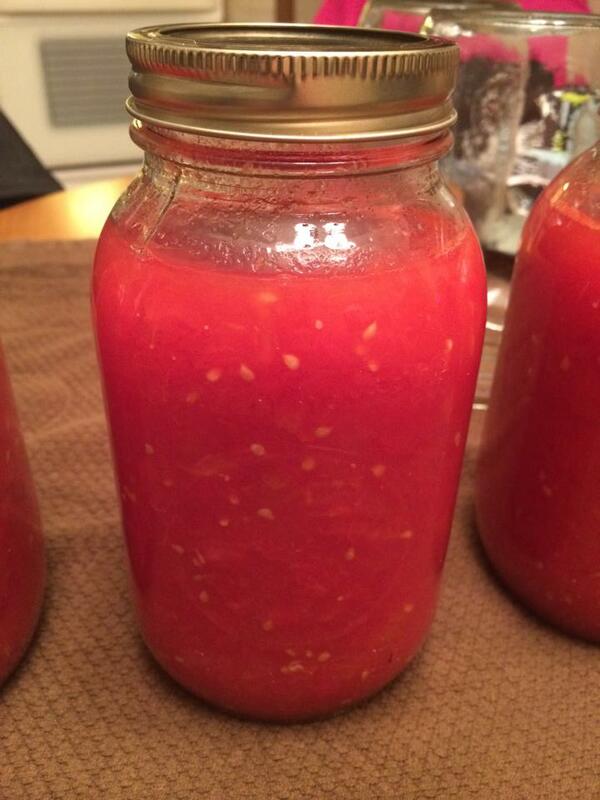 I highly recommend it on hot days. The next few km’s were not too eventful just lots of hot and tired running. My husband would push me to run to certain markers and water stations. Dad for the win again at 39km with ice and water (fyi my mom packed the travel coolers, and drove all over Guelph to find my vega gels)! More ice into the sports bra as this point it was really really getting hot. We turned the corner onto Northfield and I knew, I knew I was going to finish. There is something remarkable that you experience in the moment you recognize that your body has done for you what you once thought impossible. You get a surge to push through and finish. Bestest dude unfortunately was done. He had run over 20km (12 to get to me, and 8 with me) all the while sprinting back and forth. Through much encouragement (I didn’t want to leave him) he pushed me to run as hard as I could to the finish. He told me to “go get my time”. I managed to push through a 5:15 last km and come in at 4:05:33. A personal best for my marathon. Go figure. I never could have done it without my family, friends, and most importantly him. He has patiently sat by while I have dedicated myself the past three months to train for this event, and he has encouraged me the whole way. He is the most selfless person I know. The organizers pressed shirts with our finishing times and presented them too us! WHO DOES THAT?!?!? 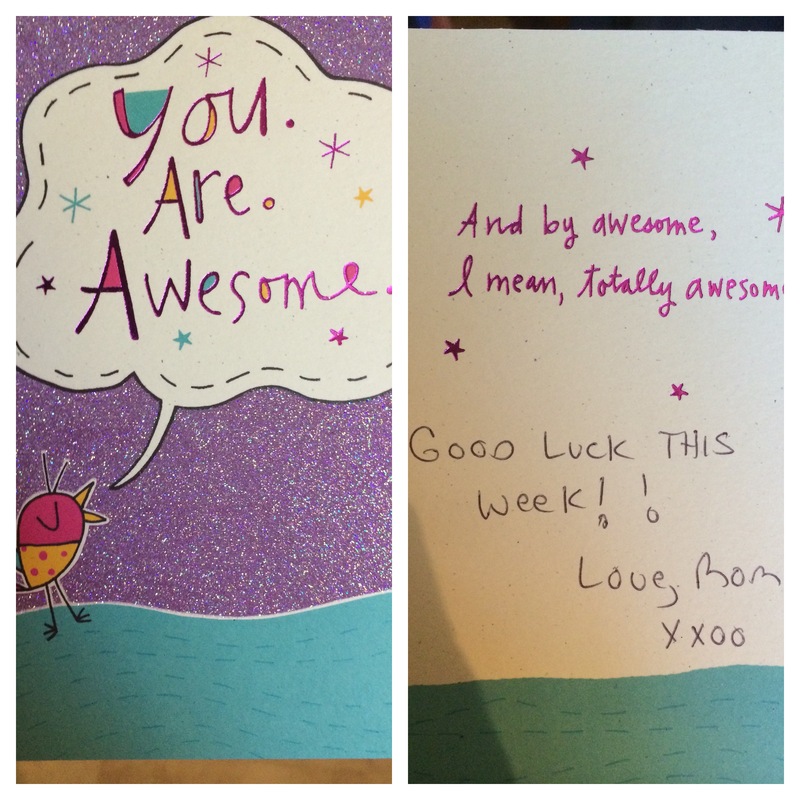 Really the RunWaterloo crew are just above and beyond amazing! This was a gift from my bestest girls for my charm necklace. My parents also gave me a Keg gift certificate to fill up on protein!!! YUM!!!! It has been a really amazing journey the past week, and I find myself sad that it’s ended. I felt as if I could just keep getting up everyday and head out for a run. There were times that my body was willing me to stop (after Chicopee), times where it wanted me to go faster (half marathon), and times where it was willing me to run (rest day). It never let me down, and in fact I exceeded all expectation in completing this event. 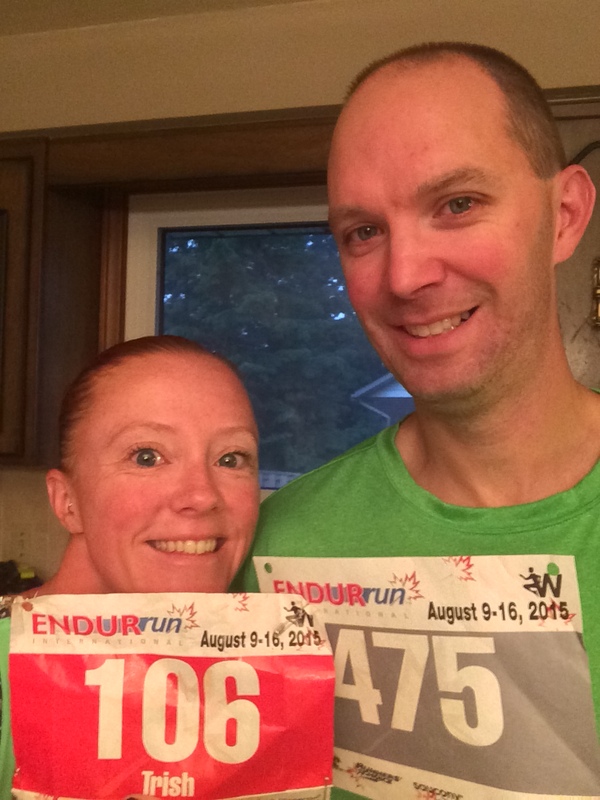 I remember the first year we ran the half and I told my husband that I wanted to one day do the whole thing. He thought I was crazy and told me so. 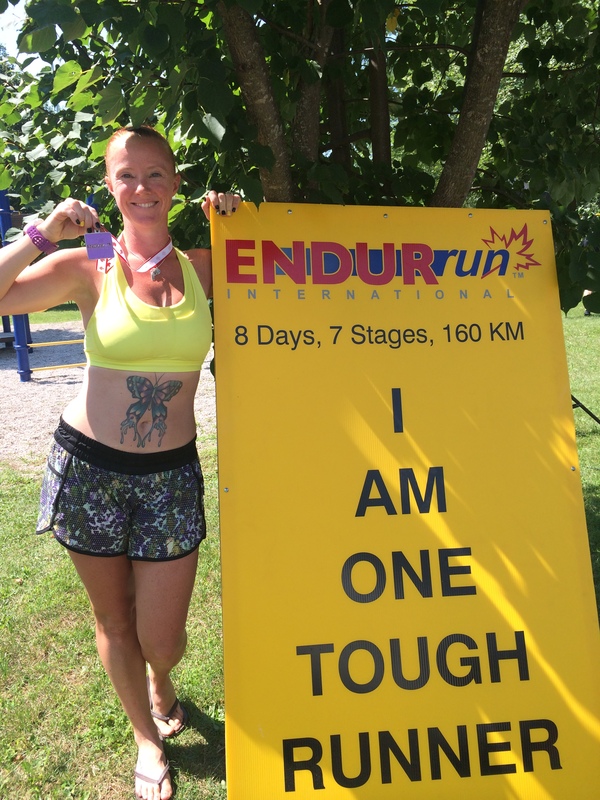 Well 4 years later here I am an ENDURrun finisher. I pushed myself to the limit and found that I was most definitely not broken. I haven’t decided if I will do the event next year, but I will most definitely guest run. I don’t know what the next year will bring but if I feel healthy enough and it fits I would most definitely do it again. I highly recommend the event and the experience, it was like no other in the world. At this point I am not too sure what can top this running experience. I am also floating around running “goalless” for the first time in a long while. 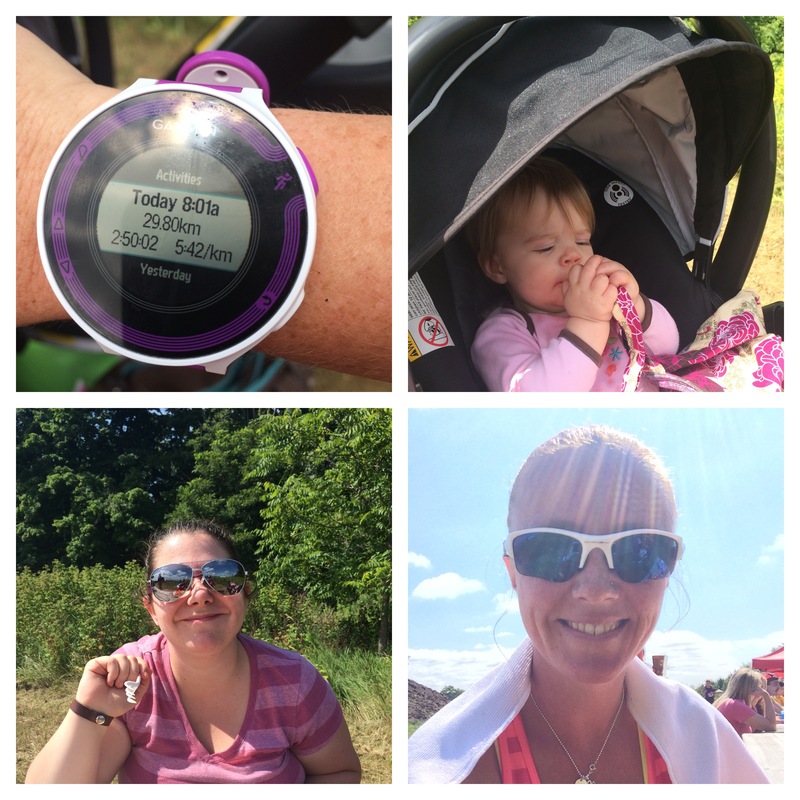 I have a half marathon in September, then a number of small 10k runs. I am contemplating the Run For the Toad 50k in October since I seemed to do well on the trail running. It is also possible I feel to run a 4hr marathon this fall given my fitness levels right now. Whatever it is I will always remember to enjoy the journey, and enjoy the run. Today was exciting for me for 2 reasons: 1) Bestest dude was running this morning and 2) IT WAS FLAT!!! After yesterdays stage and prolonged sickness (I found out a few others also struggled with this), I ended up sleeping like the dead last night. I literally woke up in the same position I fell asleep in. Although I am told I was tossing and turning alot. I can tell you I was solidly asleep this morning, and not wanting to get out of bed. Fingers crossed tonight is equally as restful. It seemed like the morning whizzed by and I felt a little disorganized. We headed out to the finish area to catch a shuttle to the start line. This course is a point to point course, and covers some of the same ground as the 15k time trial. I was a little worried because my start time was a little later in the group and I knew that there were faster runners ahead of me. I decided to just run what I could and not focus too much on my time. The course was pretty much flat. slight inclines and declines here and there but they cancelled each other out. Bestest dude started about 20 min earlier then me, so I knew I wouldn’t see him during the race. I didn’t really see anyone during the race! I could just make out the person ahead of me, waaaay int he distance but ran this mostly on my own. 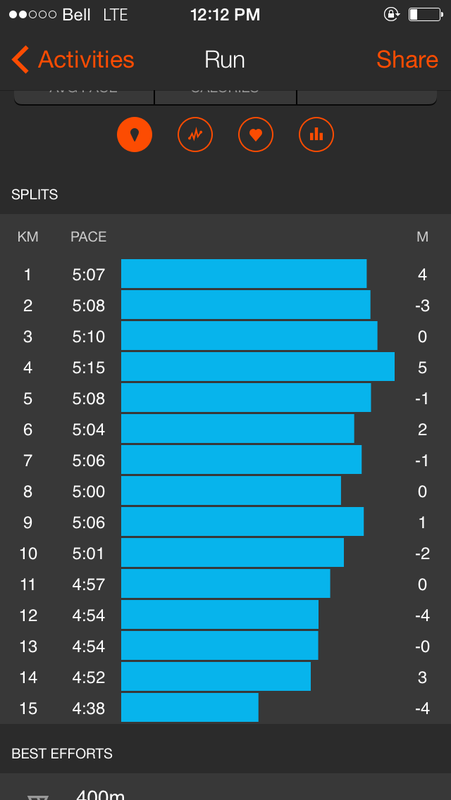 I looked at my first 2km to make sure I wasn’t going out too fast, then ran on feel. Mentally this stage was such a change from the past few. I was counting down each km marker, and there were no war cries. During the last few stages on a couple of the big hills I was letting out a large war cry. More to motivate myself then anything. This course was just about getting it done. The sun came out for the last 5k and began beating down which made it tougher. The last 2km is a straight away towards Conestogo and for some reason km #9 felt soooooo long. As I headed towards the distance I saw Bestest Dude to my right, and my brain was starting to quit. I think he could see that because he started running with me the last 500m. Yelling at me, motivating me to push. I am super glad he did because that last push kept me under 49 mins at 48:41. Then I could not stop sweating! The humidity was unbelievable today. UGH. You can see from the post pics how hot and sweaty we are! I haven’t run a 48 min 10k since 2011, so I am really pleased with my result! Although, I was essentially schooled by other ultimate females who started ahead of me! The two girls below me in the standings ran 46mins!!! Thats crazy fast, and I am super stoked for them! I’m starting to think that there may be something to this trail running for me. It seems to have been my best 2 stages. I have always known that I don’t possess speed. I have quads that are built for hard work and hills, they have always been my strength. As for my Bestest Dude?!? He managed a 47:17. Which is really remarkable for him, and I am super proud. Most people don’t know but he has had to changed his gait 2 times in the past 3 years. This is something incredibly hard to do, and takes months of work. 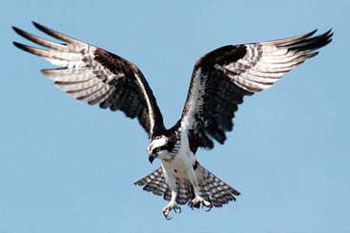 He also runs with a severed ACL (one of the reasons for the gait change). He truly is my rock and I am grateful he was there today! Soooooo….deep breath……tomorrow is the marathon. I seriously have no idea how these legs are going to carry me for 42.2km. To make it even more difficult, the expected temperature is 30 degrees, full sun, and limited shade course. To say I am worried is understating. I have actually experienced heat stroke once before (I passed out in a race 200m from the finish line). This makes me more susceptible to heat stroke in hot temps. I am strategizing a heat plan, loaded with some coolers filled with ice, and extra hydration bottles for my belt. My parents are planning on being there, as is Bestest dude. He actually told me in the car today that he would run the last little bit with me. He won’t tell me where he’s going to start with me though. My hope is to at the very minimum run for 30k. I anticipate given the heat I will need to walk at some points during the race. I would like to finish with a 6:00/km pace, but I am speculating I may be slower then this. As long as I don’t cross the 4hr 30min mark, I will be pleased. So big deep breath, Doritos, Nuun, and epsom bath this afternoon. 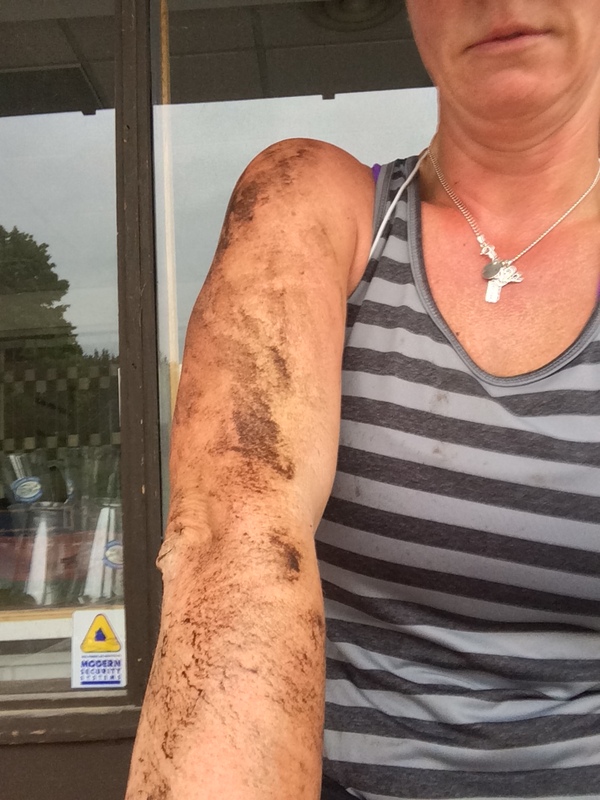 Hopefully tomorrow I will be blogging about my official status as “One Tough Runner”. Catch you all on the other side of 42km. I think that my twitter summary said it all for today..That was quite simply put, the hardest course I have ever run. I am just a simple road runner gal. Tree trunks, rocks, bushes, and single track mud and rain filled trails are not something that I am use to. Combine that with it being on a SKI HILL yes a SKI HILL, and I was totally out of my element today. Thats what I have learned this event is all about. Reaching your comfort zone and pushing, no slamming past it. Today was so far past my comfort zone that I can’t even see it in the distance! Yesterday was a rest day for the Ultimate athletes, but I had a golf tournament so there was no rest for this athlete. Every year the Waterloo Region Suicide Prevention Council hosts the Daniel Tudesco golf tournament. I go each year with a couple of fun ladies from the hospital. Usually we have some golf, drinks, and a tasty meal. 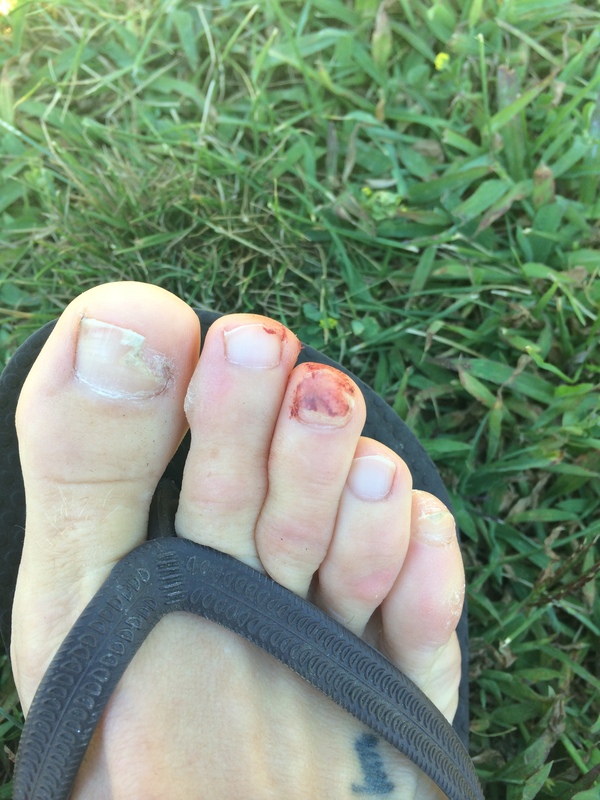 Due to the race the next day, I cut myself off at golf. No tasty drinks, and headed home to a meal cooked by my bestest dude. I did not sleep well after Wilmot, and was incredibly tired. I am not sure if it is because I had just run, or eaten but sleep did not come easy. So i wanted to be sure to make it home early because I knew today’s stage would be a doozy. So I knew it would be a doozy, and this was the stage I was most afraid of. Before today what I thought I would face, was tiny compared to what I actually faced. In my mind I knew that I had to go up a ski hill 5 times, but for some reason I was still shocked and surprised when I stood at the base of it this morning. This picture really doesn’t do it justice, but its the best I got. I was also completely unfamiliar with the rest of the course. I had no idea how many other hills there were, and what the trail sections looked like. Needless to say there was a very very steep learning curve on my first 5k loop. As an added bonus: thunderstorms. It was crazy humid, and every once and a while the skies would open up and christened all the runners. This course is definitely not for the faint of heart. The loop starts with a gradual (and seemingly forever) climb up the backside of the ski hill. I found that the first half of the 5k loop was more challenging then the second half. Although there were some more technical challenges in the second part (stairs, boardwalks). The largest of the hills was about half way through the loop. Each and every runner I saw walked up this hill at some point. That is the hill pictured above. I walked up all 5 times and I think that unless you were one of the elite runners, this is what most did. There were some definite challenges with this course, most specifically the muddy single track trails in the rain. This slowed down my overall time as you needed to proceed very cautiously around many corners. This seemed to get harder as the loops continued due to the repeated trampling of the trails by multiple runners. I had two female runner around me for most of the race, one was an ultimate, but I spent large portions running on my own. I actually felt pretty good till about the 3rd loop. I even managed to climb the first hill without walking the first 2 laps. The 3rd lap is when I started to need to walk the top portion, and by the 5th lap I walked most of this hill. Since I had never really done a course like this before, I would use the runners ahead of me to gauge my performance and speed. I felt that as long as they stayed within a comfortable distance or eyesight then I was doing okay. Overall, I am pretty pleased with my finish. My feet and my body however were not. I finally got my first blister of the week and its a big one. After the race I was nauseated, and ended up not going to work. I also had some major digestive issues. These both didn’t clear till about 4pm, and why I didn’t blog until now. I was unable to eat much and managed to get a small amount of smoothie down. By 5pm,I was ravenous!!!!! I still needed to take the food in slow because my stomach was sensitive. There were points that I really loved this race, and other points where I cursed it as the death run. I loved the single track trail portions, at least until they pooled with water and mud. Once they got slippery it was hard to enjoy them and I was more focused on being careful. I didn’t want to hurt myself for the last 2 stages. 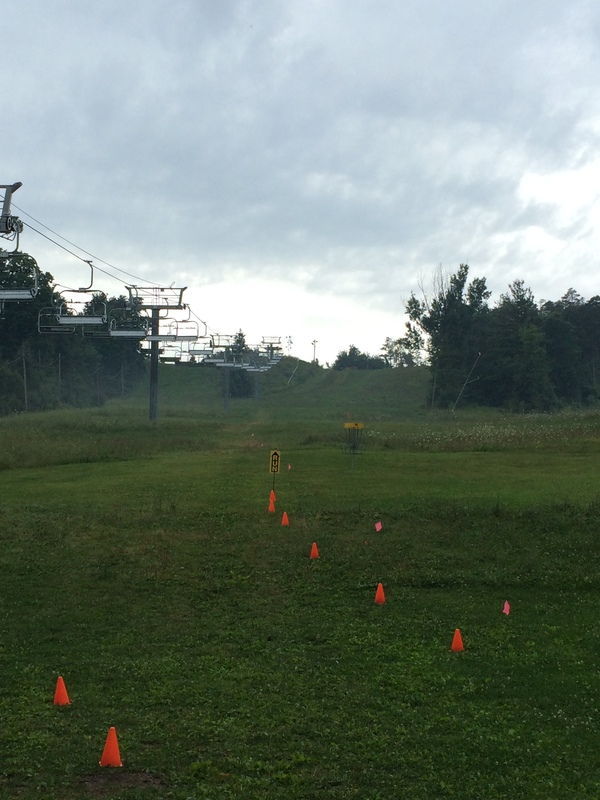 I hated the ski hill, but I challenge you to find someone in the race who didn’t. I will bid you adieu while I go soak my achy feet and legs in an epsom salt bath. Tomorrow brings the 6th stage which is a 10k time trial. Im excited because bestest dude will be running the event as a guest! Also did I mention that it’s FLAT? I am so excited to run on flat ground tomorrow. 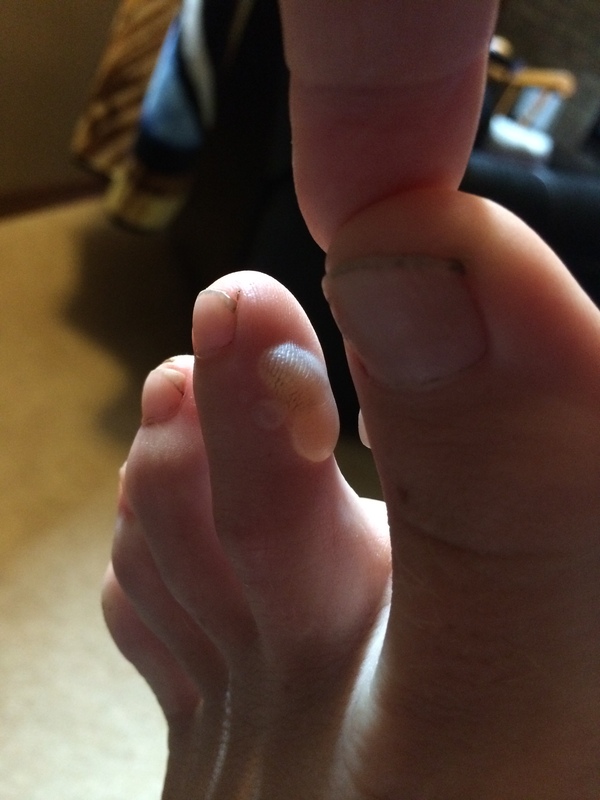 Until then I will leave you with my km pace, and a pic of my nasty blister. Yup, I went there. You want the whole experience don’t you? I will tell you a secret. 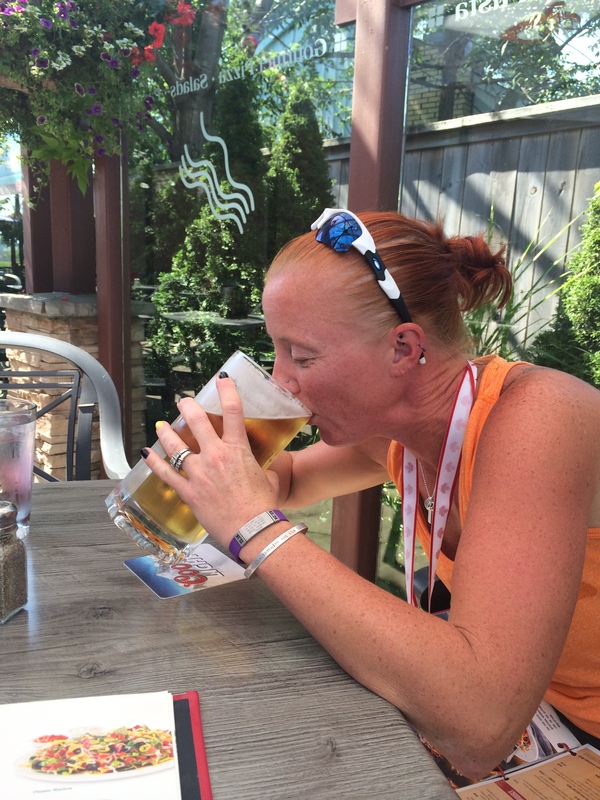 I have been having a love affair during my training for the ENDURrun, and it has been with Wilmot line. I started running Wilmot line because I knew it would be tough and wanted to mentally prepare myself. I never knew I would learn to love it so much. I not only love the challenge of it, but it is beautiful running through the country! Let me give you a sense of the massive hill we run. 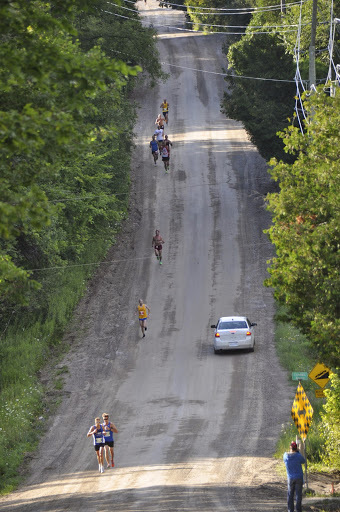 This pic is catching it on the way down, but we actually run up this hill at the 5k point. I was slightly worried about racing this course, but I knew that my body was familiar with it. I actually felt the most confident today out of all the courses so far because of this familiarity. The race was a 6pm start so I went to work for my usual shift today. I am actually really glad I worked today as it kept me busy and distracted. I work on an acute unit in a hospital so it is usually a busy place. I made sure to wear my compression socks under my work clothes, and I was ready to go! In my discussion with a doctor today my race came up. I find that people generally look at you with their head slightly cocked, and a blank expression at first. This is usually followed up with “you’re crazy” and “i wish I had your energy”. I am fortunate that I live close to this venue, and it only took me 5 minutes to drive there from home. Pounded back a coffee and tucked a vega gel into my bag for the run. I had practiced running this route at 6pm so that I could make sure I knew what my nutrition needs were throughout the day. I had a solid lunch salad with protein, and knew the coffee and gel would be adequate. Weather again was perfect! The sun was a little warmer so this warranted shorts and sports bra only. Again I managed to run a bit quicker in the second half but you can see that my times really fluctuated on this course! You can also see clearly where horror hill is based on my 5:48 km. This race had the best post-race grub of all simply because there was sweet corn!!! It was so good and warm and salty! Overall I was really happy with my result again. I am however, looking forward to a rest day and that is what today is! I am in a golf tournament all day which is probably not the best idea, but I go every year. It is for a great cause, the Waterloo Region Suicide Prevention Council, so I am glad to go. I am going to take it easy, skip the golf dinner, eat at home, have a bath and early bed. It appears that I could not sleep for the life of me last night after the run! I hope to get some zzzz’s tonight. Thats it for me on the recap! I’m off to do some golfing. I will leave one last pic of my finishing time. Ypu can see the beautiful trees in the background! Next up 25.6k up a ski hill at Chicopee *gulp*. Anyways, so the bird attacked me and I wouldn’t go to Bechtel after that. I finally braved the bird and headed back last week to do 2 loops, and mentally prepare myself. That was the extent of my trail training. What I did do alot of in training however was HILLS! Lots and lots of hills. 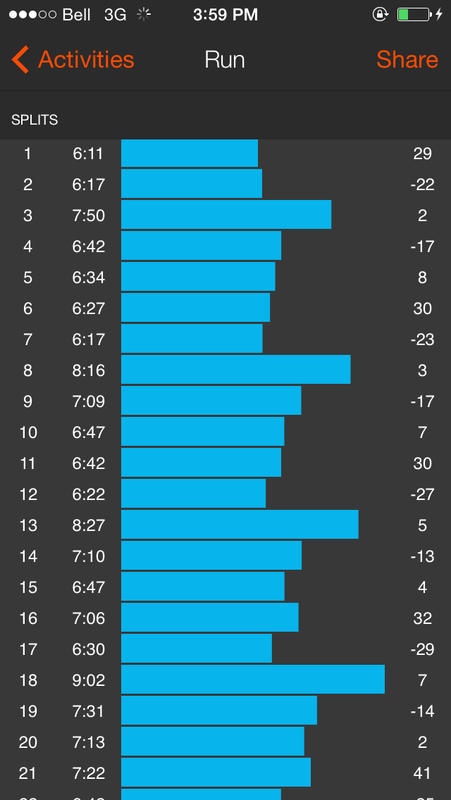 Whether it was running at the cottage or Wilmot line, I managed to make sure hills were a part of most runs. I mention this because it certainly paid off in a big way today. My nervousness of today’s stage did lead to lack lustre sleep last night though. I still managed to get some solid hours in. Once the race started my brain settled down and I hit my stride. Of course it helps that my bestest girl and her daughter showed up to cheer me on. I saw them at the start line and it automatically boosted my spirits and determination. 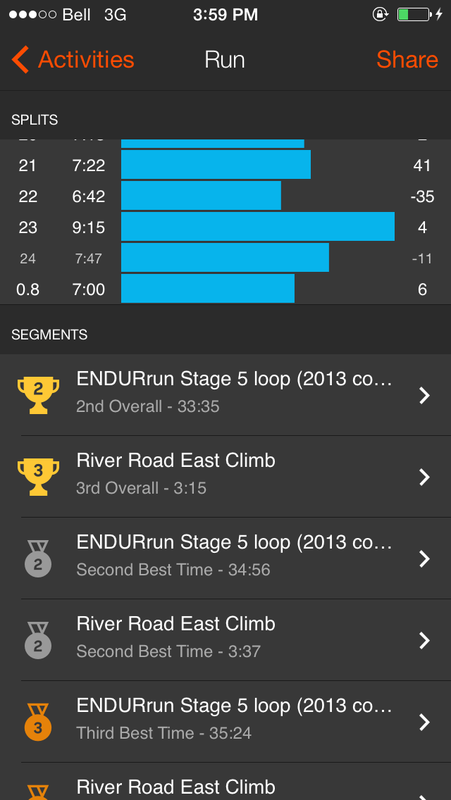 I wanted to run conservatively for the first few loops in order to save some gas in the tank for the last of the loops. 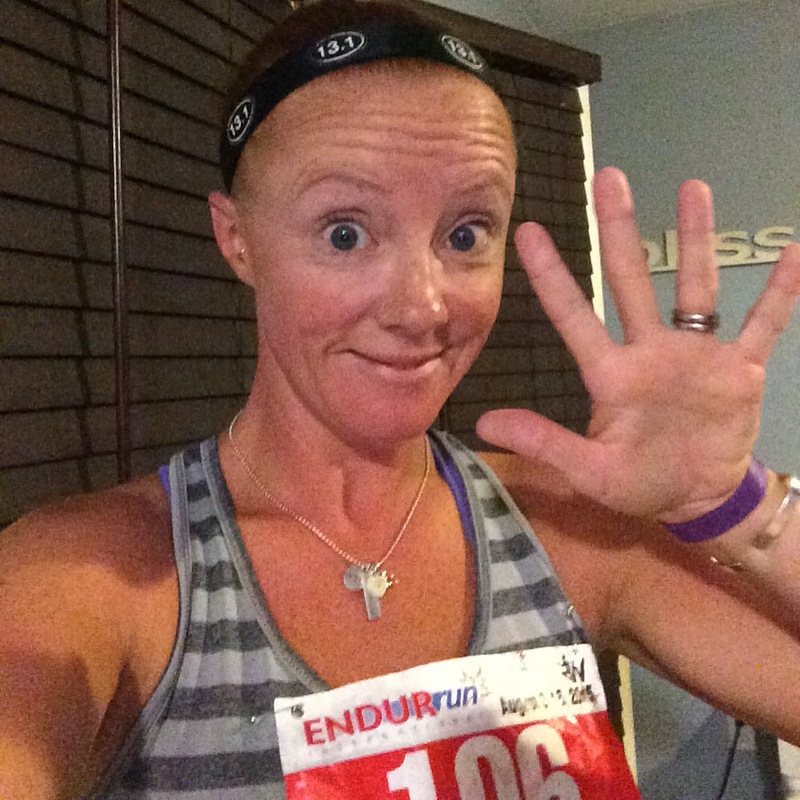 I had figured that it was going to take tough mental slugging to get through loop 5 & 6. I had also made a promise to myself that no matter how slow I went, I would run up every single hill. I had a sense that if I walked any of them it would break me. This game plan is exactly what I did. I learned that I actually love the fact that it was a trail course and that it was loops. I could break it down mentally into 5k increments. 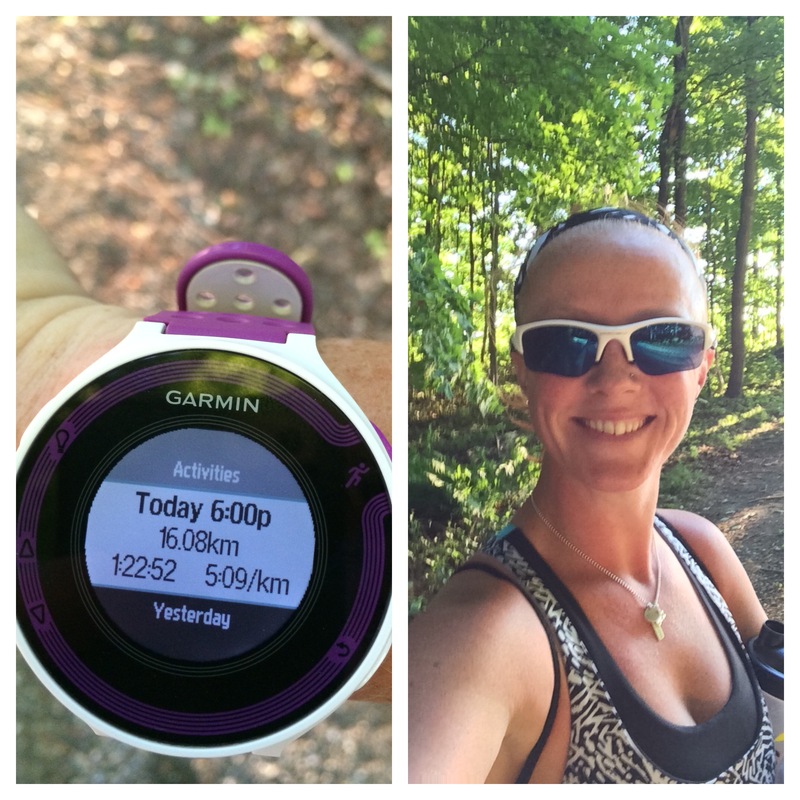 The trail allowed me to keep my interest piqued in a different way than road running. I had to be alert and aware particularly in the last laps on the downhill portions when my legs were tired. I felt really strong in the first 4 loops. 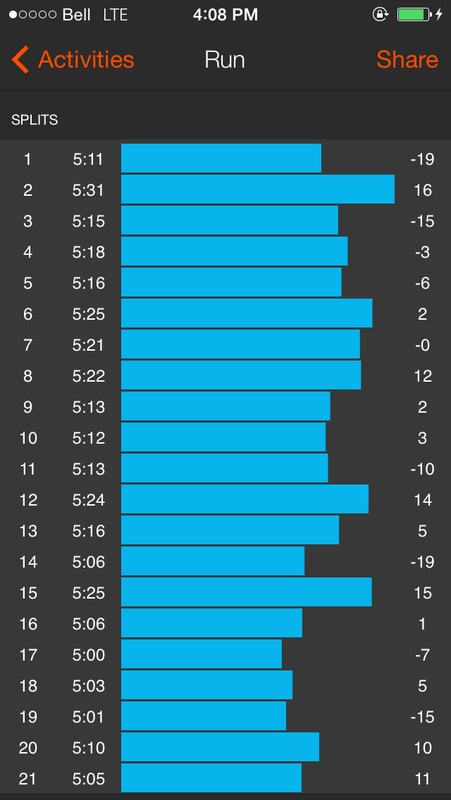 I was surprised how good my legs felt hitting the hills today.I maintained a fairly steady pace throughout the race with the second half being slightly quicker per km. 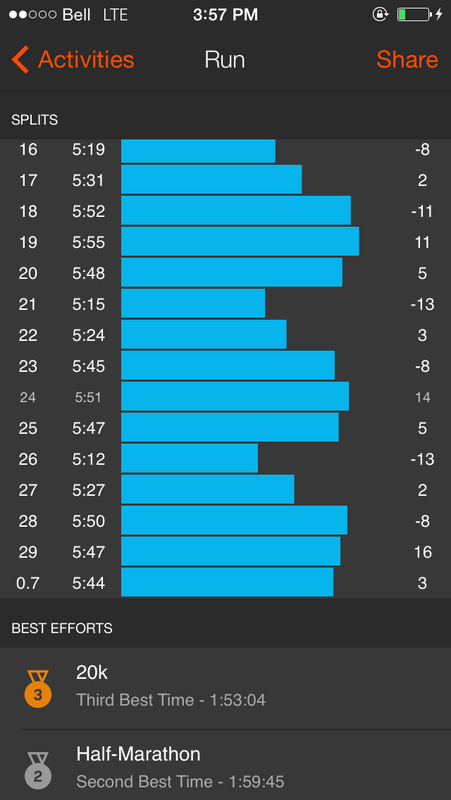 You can see from my splits below that I did not like km 4, 9, 14, 19, 24, and 29. There’s actually a gradual hill at these km’s leading to the end of the loop which was the start/finish line. On loops 5 & 6 my legs started to get tired, and the mental battle began. I remained determined to run up each hill, and this is where I saw a number of runners begin to walk up the hills. It was really humid and those hills were tough!!!!! During the 6th lap everytime I did a hill I would tell myself “this is the last time you are ever going to see this hill today”. This is what managed to get me to the top of each one. I also had to break the lap down mentally to 2.5k increments because my brain was getting in the way. I managed to gut it out, ran every single hill, and clocked in at 2:50:05. This was 10 minutes faster then my goal time for today!!! I was super proud of myself, and really happy with my time. Best part?!?! My bestest girl waiting at the finish line! Oh did I mention it’s HER birthday today?!?! And she came out for me! She really is remarkable and I am a lucky girl to have friends like that. Oh and a big shout out to New Balance. 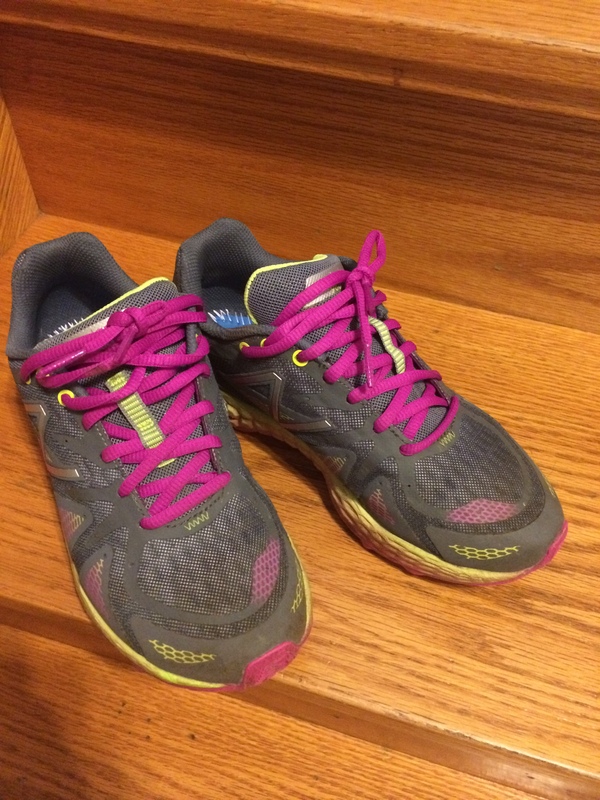 I broke a runner rule and ran with new shoes out of the box today. The New Balance 980 trail shoe. They were amazing!!! Not a single issue, blister, ache or pain! Pretty swanky eh? So three stages in and this has been a fabulous experience so far! I’m not really competing with anyone but myself, but I have to be honest it felt good being so strong on the hills today and passing some people. I’m going to relish the moment, and be grateful for the training I was able to get in. Some people were battling injuries, and I am sure life circumstance in their training periods and still persevered today!!! I admire them for that! Right now I am appreciating my training, and crossing fingers that I can keep slugging it out for the rest of the week! 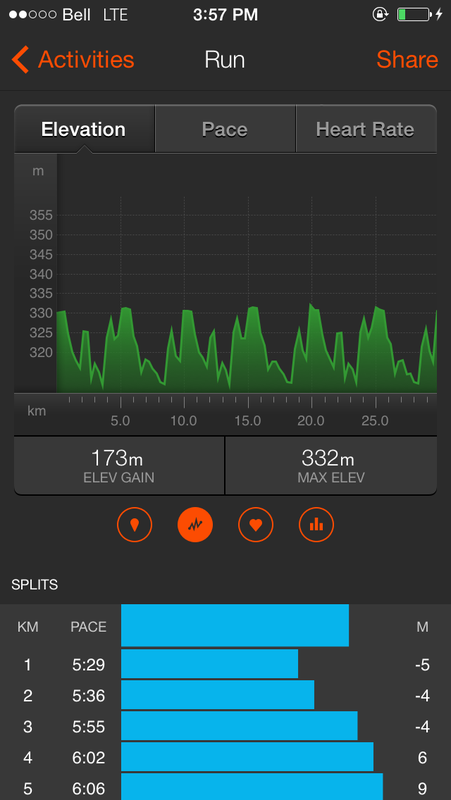 Tomorrow is the Wilmot line run which is CRAZY hills.I have spent some time in my training along this route and have fallen in love with it! I may not be so in love tomorrow on these tired legs, but I am still looking forward to it! That’s it from my end for today! 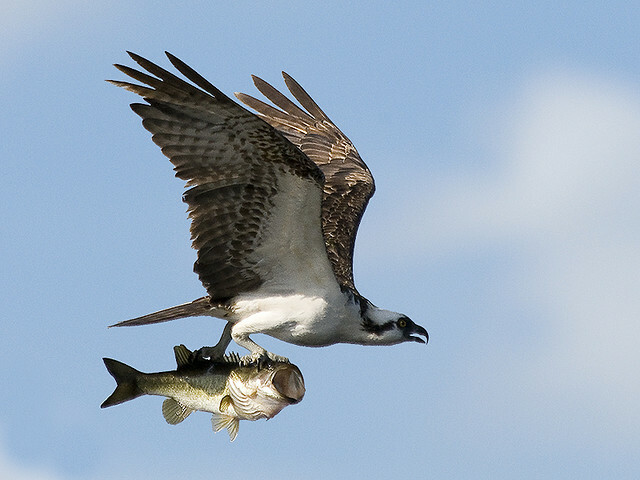 Time to rest up and enjoy some grub! Today was an exciting day for me! I have never been or taken part in a time trial so I was eager to experience it. For those that have never experienced a time trial, usually the racers are staggered at intervals starting from the slowest (from previous day’s race) ending with the fastest. This means that you can track other folks down, and will get passed at some point by some faster runners. Today’s 15k time trial was an out and back course. I was questioning would I push to catch up? Would I get a mental blow when passed by others? The course is very very flat so you can see the runners ahead of you for long stretches, and there is a turn-around at 7.5k so you can see the runners catching up to you. I was also curious how my legs would feel after yesterday’s half marathon. I spent most of yesterday resting my legs after the half. I did all the necessary chores, and then settled in to watch golf. My afternoon snack consisted of some zesty cheese Doritos, and a large glass of nuun. I also felt it wouldn’t hurt to throw a fresh pair of procompression socks on. Dinner included some chicken shish kabobs, and freshly shelled peas (which I did while lazily watching golf). I totally took advantage of this down time as I have to work for most of the week and will not have this luxury. I woke up this morning and took a tentative step out of bed, my legs felt surprisingly good. No weird aches or pains, muscles feeling fairly recovered…this might actually be ok. Relaxed with my coffee, surfed the net, and headed out to Conestogo. 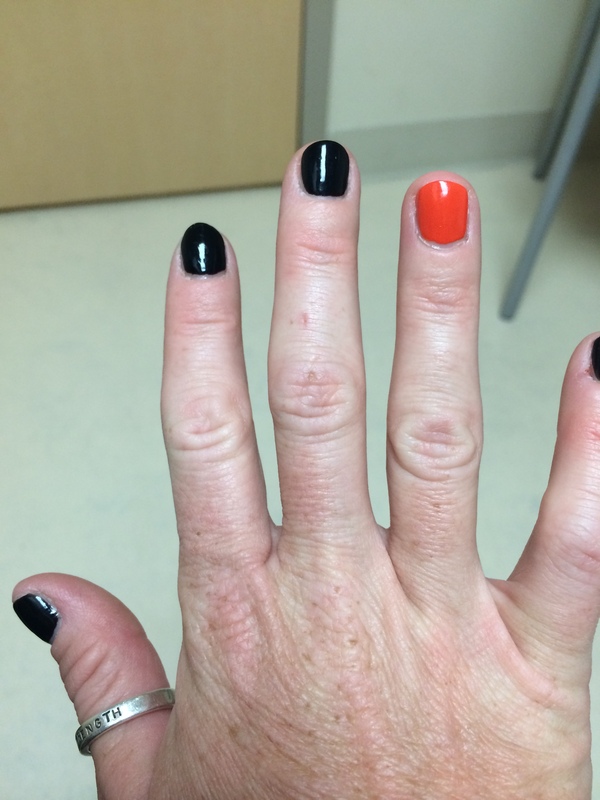 Today was brought to you by the colour orange and of course I had my nails painted to match (its good luck you know). I said hello to a couple of the runners I met yesterday, and wandered over to the start line. The weather was absolutely perfect, high teens and clouded over. The humidity made it feel mid 20’s but it truly was ideal. As usually the race was impeccably organized by the RunWaterloo team, as the runners seamlessly began to head out. 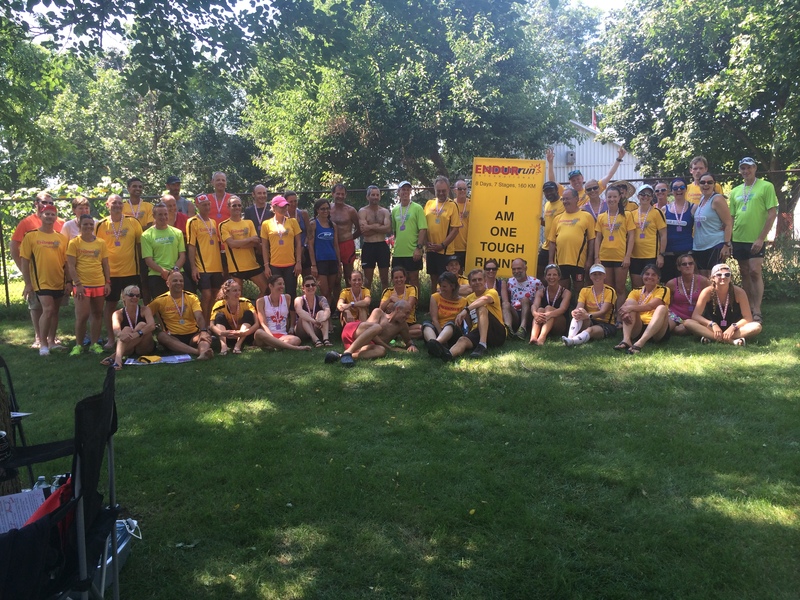 I love the runner community in Waterloo! Each runner would approach the start line, and each time they were sent off everyone clapped and cheered for them. It really is a great way to start a race and gets you pumped! My timeslot was 8:28am, and as I approached the start I actually felt relaxed (who knew). A quick countdown and off I went! One of the things I have begun to learn while training for this event is that I love running in Waterloo Region. I generally tended to stay in the small box that is my neighbourhood, or would venture out at the cottage. 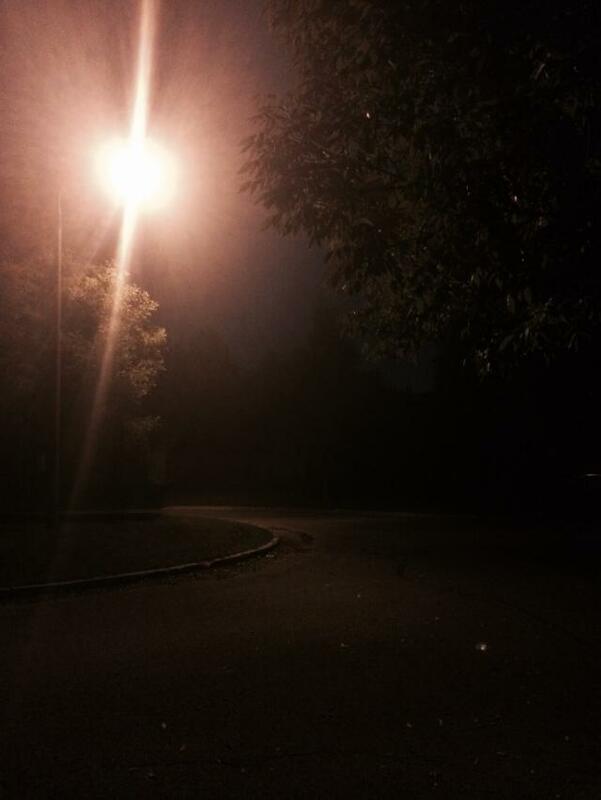 While training I began to run in the surrounding areas and fell in love with routes such as Wilmot line. It was the same with this course. Mind you, it helped that it was flat so what is there not to love? I loved running in the country seeing the farms and crops. I think my happiest place was when we hit the gravel road. I was waving to Mennonites, and just taking in the scenery. Conestogo is one of my favourite little villages, and I always tell my husband if I could move anywhere it would be to that community. Now don’t get me wrong, that doesn’t mean that I was lollygagging on the course. I managed to run a mean pace. Well, for me anyways. I learned the time trial can be good and bad. Being ADHD I have trouble at times seeing “past the moment”. This means that I was determined in this moment to catch folks, and push myself. I don’t know at this point if I will pay for this come tomorrow at Bechtel, but it was a fun ride. It has been a while since I pushed myself to run at a 5:00/km speed but I managed to do this today clocking in at 1:15:21, 5:01/km. I negative split the course, and completed under 5:00/km for the last 5k. 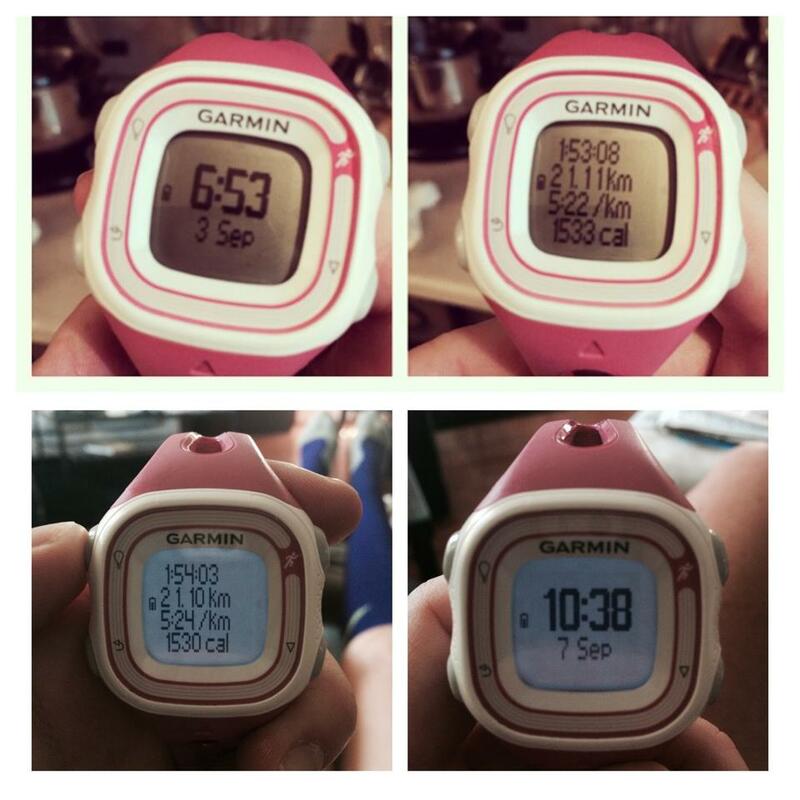 For the first 10km I wanted to stay at minimum 5:15/km and did this. I know that generally I am a negative split runner (I always start too slowly), and can usually push the last 5k of a race. My goal was at least to stay at 5:00/km for the last 5k, and I managed to exceed this. It’s incredibly hard to not increase your speed when you see that large finish line in the distance. I was very happy with my time today. I don’t have really anything to compare it to since I have never done the event before, but against my practice runs I seem to be doing pretty good. I managed to gorge myself on some delicious eats (the apricot bars were ridiculously delicious! ), and then had to head back home. Unfortunately I need to put in some work hours this week so needed to be in by noon. Don’t worry I have recovery taken care of. Some procompression on under the pants, and some nuun in the purse! Tonight I may have an Epsom salt bath just to relax the quads. As for tomorrow? I have told myself that I would like to keep a 6:00/km pace on the course. I plan to take it nice and easy, and then get my massage at Dearborn Health in the afternoon. I took tomorrow off from work because I know it will be a doozy! It was a little strange because my bestest dude was not there today, and I don’t really know many of the runners except through social media. 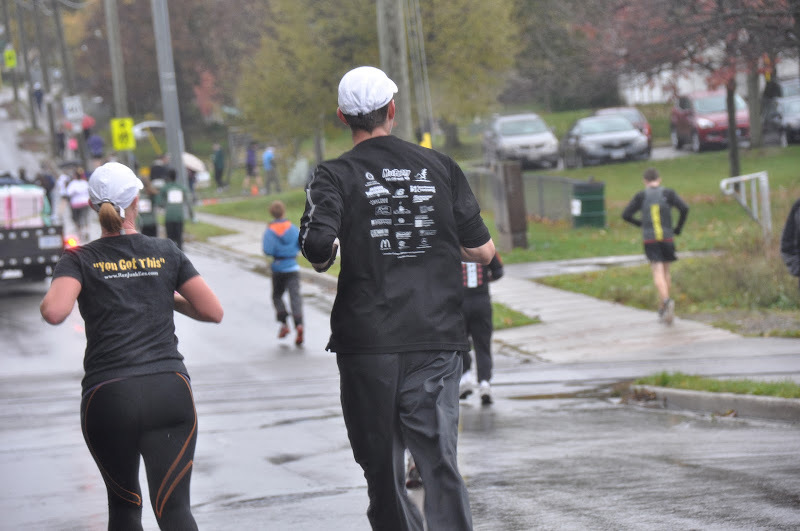 Many of the runners know each other through local running clubs or groups. Towards the end of the day I was fortunate to meet some of my social media buddies, who were really welcoming and friendly! The weather turned out to be perfect, and my legs were anxious to get it underway. They had spent months running on tired legs in preparation and had spent the week resting and preparing. I likened it to drinking an extra large cup of coffee every day. I had overwhelming energy! Quick and awkward countdown, and we were off! I am fortunate to be quite familiar with this 1st stage course as this was my 4th year running it. Bestest dude and I have been a guest runner at this stage for the past few years. I knew that there was lots of hills and that I needed to be cautious with my energy. The route consists of a 13k lap followed by an 8k lap. I knew right away that I was going to have a good run. In fact I worried that I was running too fast in the first 10k. 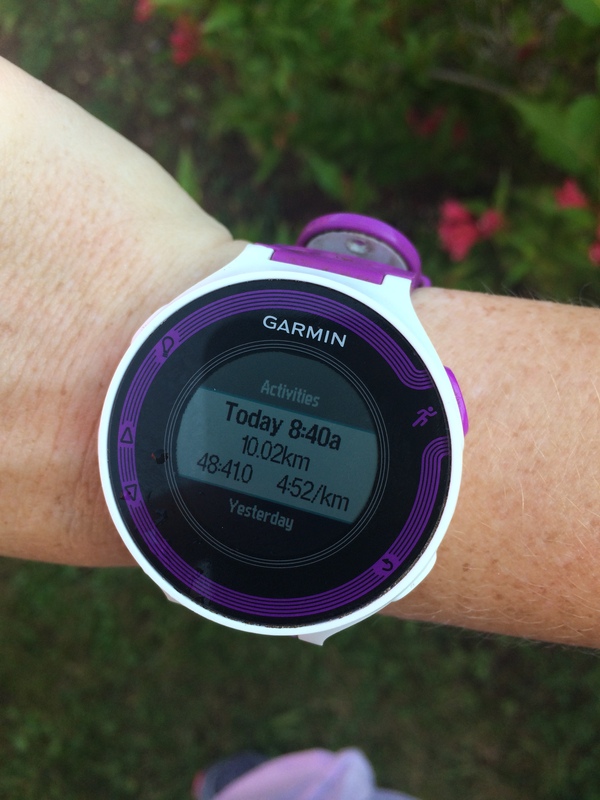 I have been training with times around 5:30/km for my runs. This race I was clocking 5:15. 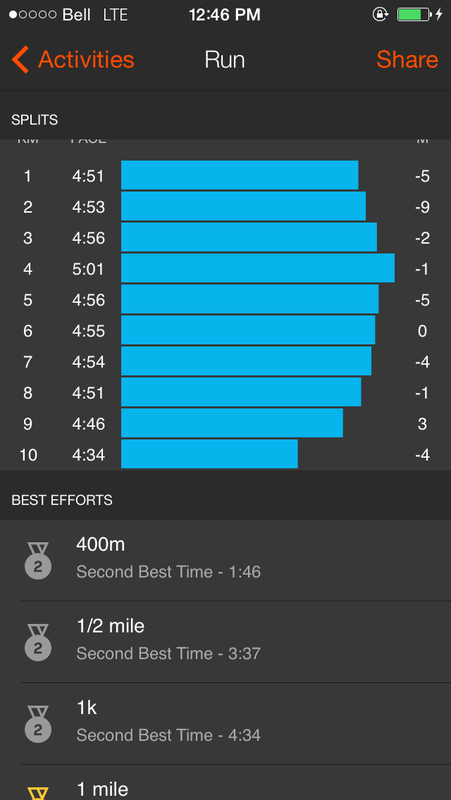 Every once and a while I would slow down to a 5:25 because mentally I felt I should, but my legs wanted to run faster. There are some great flat sections in this course where you can settle into a groove, like the Grey Silo golf course path. 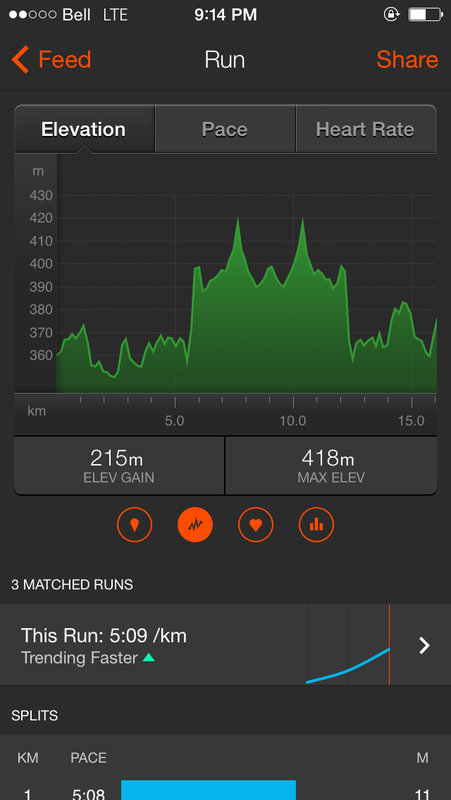 I felt strong on the hills and I attribute this to Wilmot line training and the cottage. 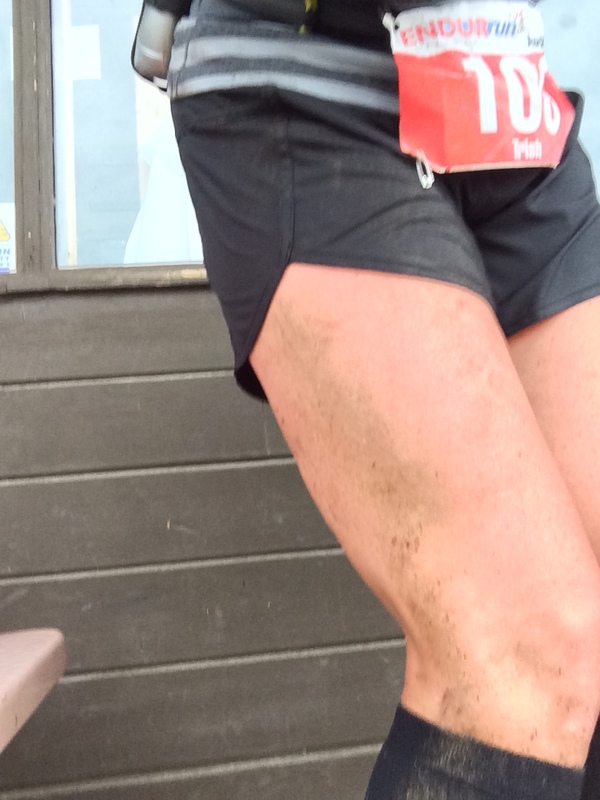 I wore my hydration belt for this race and I am glad I did. 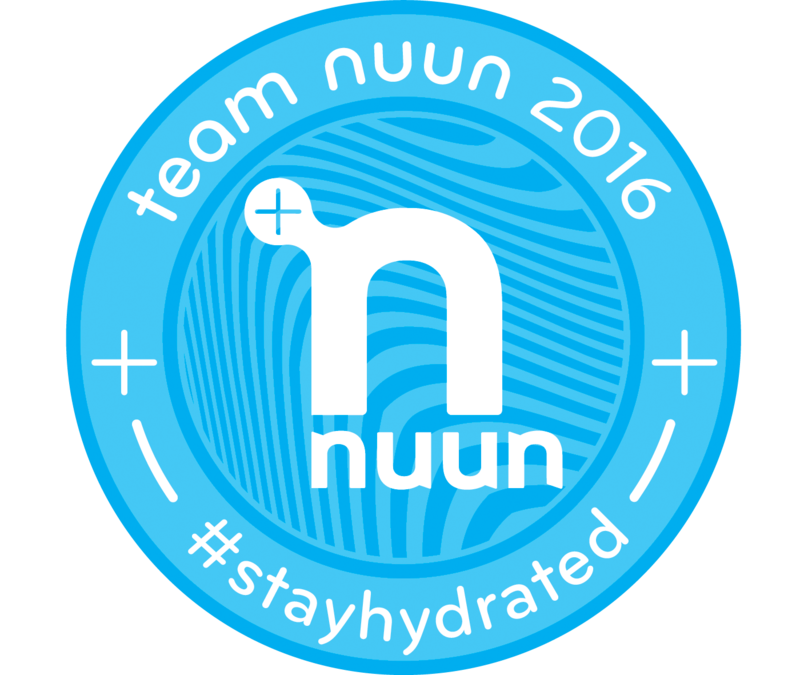 This allowed me to bypass water stations, and keep myself replenished with nuun water. Along with 2 vega gels at the 8k and 16k mark, and my fueling was spot on. At 13k I was clocked at 1:08, and had 8k to go. The sun was much more of a factor on the second half of the run which had very little shade, and also made for a very salty runner at the end of the day. Managed to push up the hill at 5:25/km, and fall into a pocket for the last portion of the race. I have a mantra that I say in the last 5k of every race “I can do anything for 5k”. Cleared the last 5k without dipping slower than 5:10/km, with a finish time of 1:50:18. Well it appears I have been slacking. Unfortunately I got into a slump. I managed to finish out 2014 with a fantastic half marathon time and then I slipped into the vortex. It has been difficult with varying medical stuff to maintain consistency in my running the late half of 2014, but I am back on track with a vengeance. I have decided to commit and revamp my blog for 2015. I actually contemplated letting it go, but I remember when I was leading up to my first marathon how cathartic it was for me, and let me tell you, I have BIG running plans for 2015. I feel like 2014 was a lull for me and I wasn’t really attempting to reach any large goals. It felt like I was aimlessly wandering through the running world and my training reflected that. 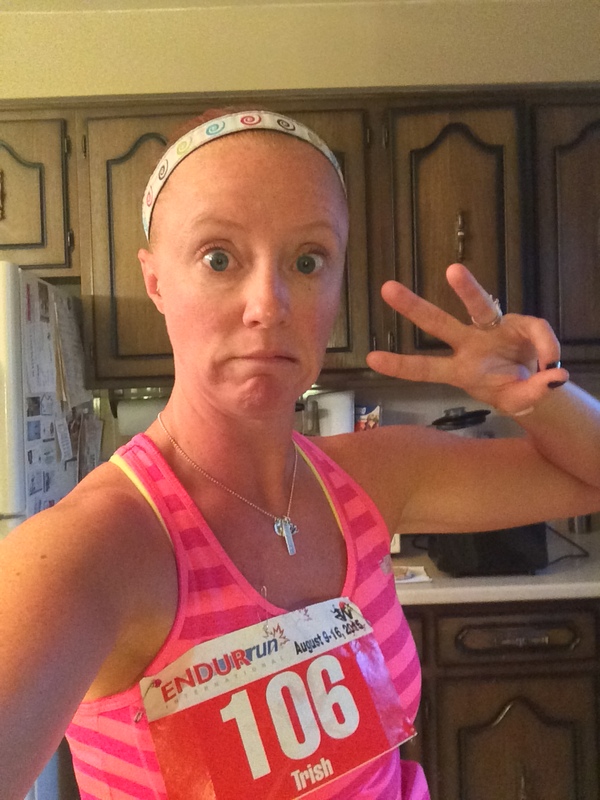 I managed the same times, I ran the same races, and basically I developed a form of runner’s burnout I think. So this year I have taken a new path. 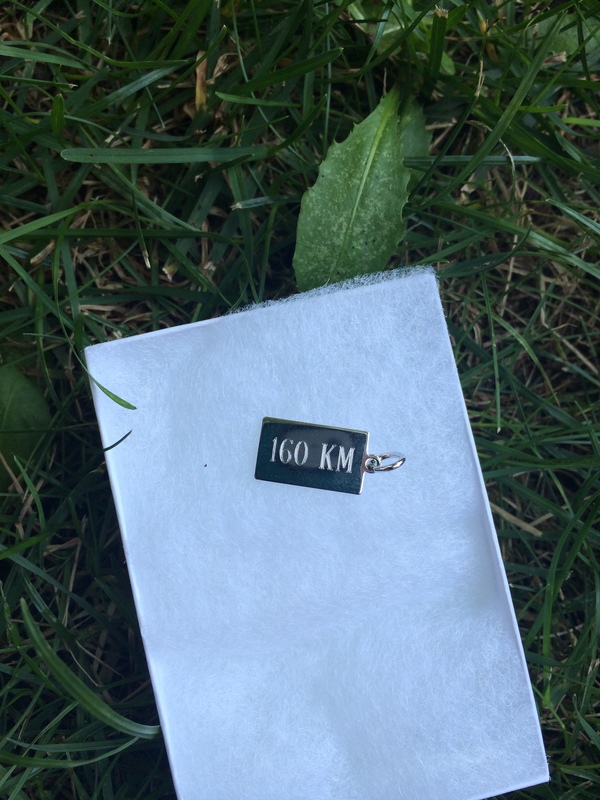 My major events include 2 marathons and a 160km 8 day event. My goal is to maintain the blog, and maybe add some features to it. I have decided that in 2015 I want to become the best person I can possibly be. I have felt that given some of my life circumstance I am at a crossroads, and its time to either go left or right. I look forward to what this year brings, and I look forward to pushing my limits. I am thankful for my bestest dude (husband). I bet some of you saw that one coming. 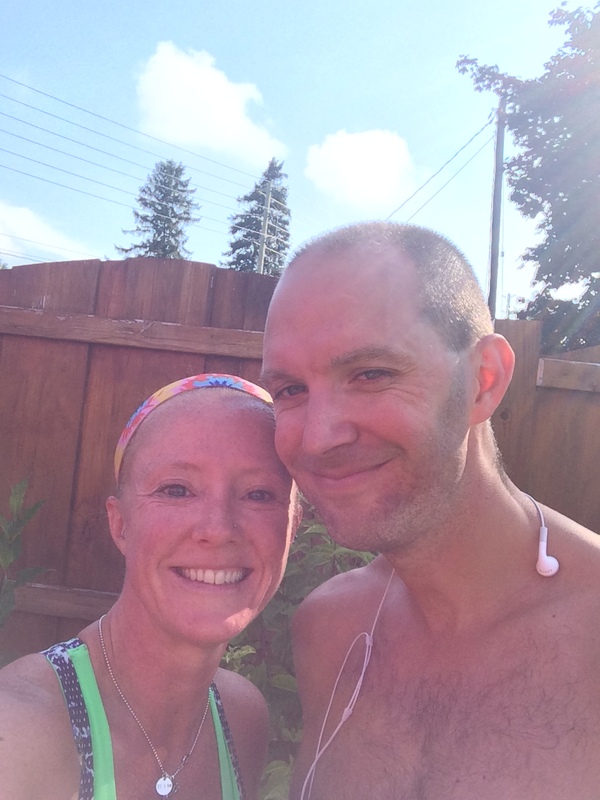 After my marathon I wrote briefly on what a fabulous guy he is. I was really fortunate to win the lottery on this one. I sure waited a long time for him to come along (30 years), but I am glad that I never settled. That isn’t to say that we are perfect, because when we disagree we can both be stubborn, but that is to say that he is perfect for me. He has supported me with all my dreams the past 7 years, and put up with my tumultuous moods (picture grumpy bear and watch out). He is very patient, kind, and straight forward with me when he needs to be. He is also my running buddy. When I was injured 5 years ago, I was off running for a year. When I came back to running he was there with me every painful step of the way and continues to be. I am definitely thankful for him in my life. Now onto other things. So I set all these ambitious goals in my last blog posting, and wanted to be sure to let you know how those have been going. I am happy to say that I have reduced my caffeine consumption to one coffee per day! *happy dance* There was one occasion where I had a second coffee but was sure to make it a decaf. I have also increased my water consumption. It started off with the 5 day water challenge I spoke about. I was consuming 80oz of water a day during the challenge, and have used this as a jumping point to consistently maintain a minimum of 48oz. My hope is to be able to maintain at 80oz, but I am trying to be realistic! I keep a large 32oz jug of water on my desk at work throughout the day, and this reminds me to chug a lug. I have also only spent one occasion drinking alcohol, and it was my cheat day! The first day of the football season how can one say no to cheap chicken wings and beer? I am pretty proud that despite this cheat day I got back on track, and maintained my wish to eat and drink clean! My one cheat day this week will be Sunday. We are travelling to Buffalo for the Bills home opener game, and I just can’t commit to being a good girl during tailgating. 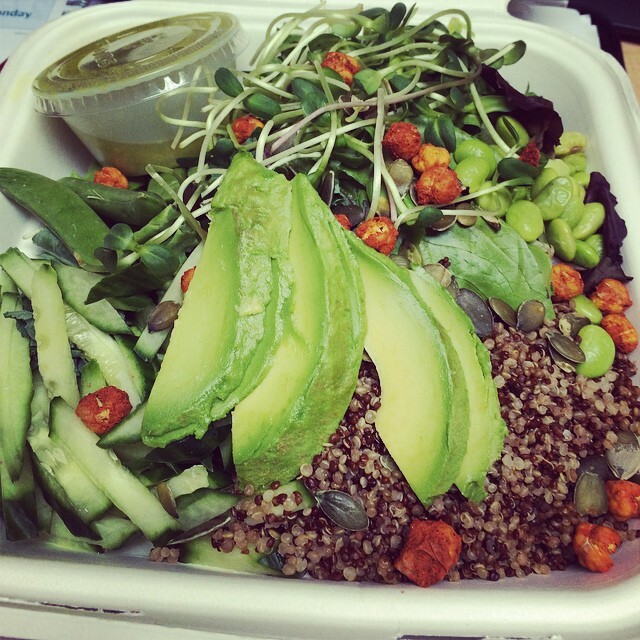 Here’s a quick pic of my delicious clean eats salad from Thrive Energy Bar, and the homemade (and sugar free) tomato sauce I canned! As for my running, it feels great!!!! I don’t know if its fall, the vega sport, or just that I am treating my body well but I feel so much better on my runs! I even ran two half marathon distances within 5 days of each other. Both of these were at 5:25/km which is so much better than where I was last fall. I am hoping that this will continue and I am beginning to appreciate the consistency of running and eating well in my life. I haven’t increased my long run mileage yet, but I plan to do so after my half marathon this weekend. Speaking of which, I am super excited about the half marathon race I am running this weekend. Well also slightly nervous because this is a brand new race and I have no idea what the course is like. I would really like to come in at 1:51 but not knowing what the hills may be like makes it difficult to know if this is possible. Fingers crossed. It’s called the Harvest Half, and is another fantastic event by the folks at Run Waterloo. 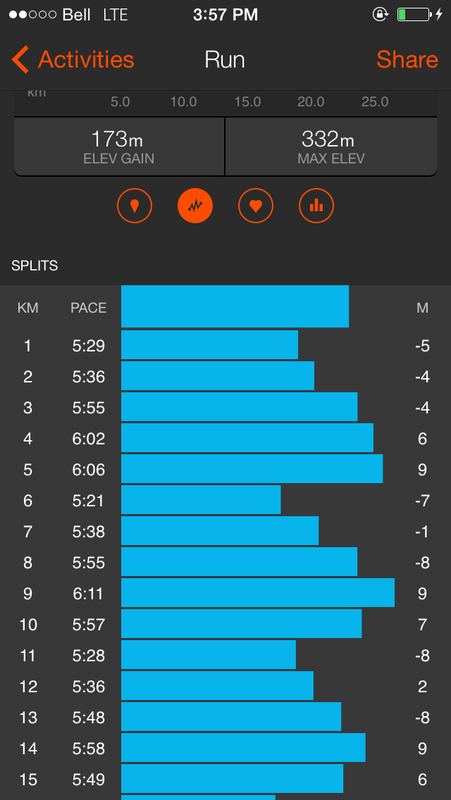 I went for a 5km tempo run this morning to shake out the legs, and all systems seem to feel pretty good. Although the fog made it a little like something out of Criminal Minds or CSI. Check this out! Finally, for those who are following my trial Vega sport journey, I have to tell you I’m a believer. Now if I said to you it was because I have felt better over the past two weeks than I have in a while, you may write it off for a multitude of reasons: 1) It’s fall 2) I am eating better 3) I am drinking more water 4) I am running more consistent. However, I have been more consistent with my running, including higher mileage and I still feel great! My legs are much more “ready to go”. I noticed this especially this morning. I ran two half’s in 5 days then took two days off. Normally I would have a lethargic and gross recovery tempo run when I came back. When I ran this morning, I felt awesome! My legs didn’t even feel tired. This is something I have not experienced in a very long time, like when I was in my 20’s (and I am 37). I don’t know if it has to do with the Vega Sport, but I am starting to believe. The other comment I wanted to make was in regards to the endurance gels. 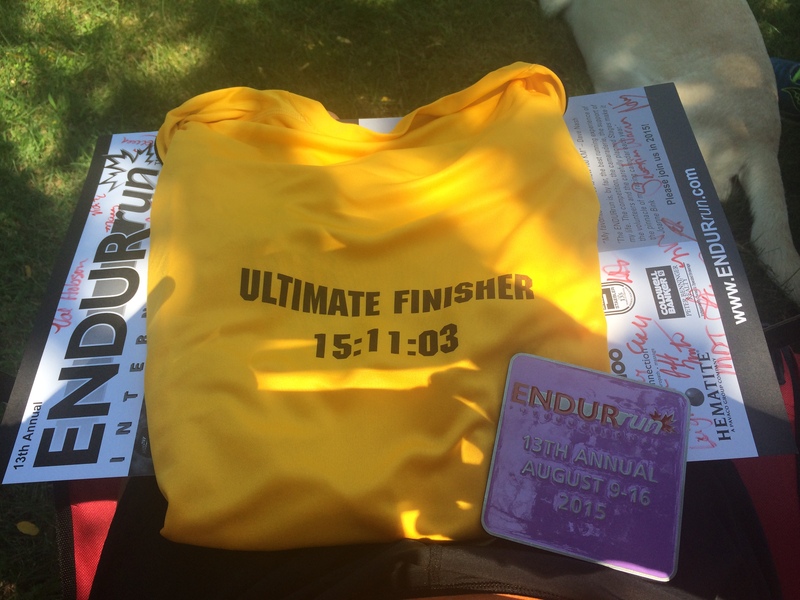 I was forced to use my GU energy gels this past weekend because I had run out of the Vega. I was completely wrecked by GI issues afterwards. I also crashed really hard after about 4k of taking the gel. It made me miss the Vega. If anything I am sold on their gels, and my GI loves me for it! The only problem is that these are harder to locate in my community than the other Vega products, so I need to prepare ahead. Oh and a sidenote, the peanut butter chocolate protein bars are DELICIOUS!!!! So I have decided to make a commitment to their accelerator (tropical), protein powder (I still haven’t decided what flavour! ), and the gels (definitely raspberry). Although their protein bars are delicious too! Again, I was not endorsed or paid to write this, I just honestly enjoyed the product! So I think that is it for today. Stay tuned for tomorrows Thankful Thursday, and happy running!